In May 2017, B’nai Brith viciously attacked NDP Leadership candidate Niki Ashton for speaking at a rally for Palestinian human rights in Montreal this past weekend. Niki Ashton has stood up for Palestinian human rights; now it’s our turn to stand up for her. The United Nations Relief and Works Agency for Palestine Refugees in the Near East (UNRWA) was created in 1950 to carry out direct relief and works programmes for Palestine refugees, and is unique in terms of its long-standing commitment to this vulnerable group of refugees. Canada has been a prominent supporter of UNRWA since its inception, but under the previous government, was the only donor to have ever withdrawn funding. Donate to urgently needed medical supplies and medicine to Al-Ahli Arab Hospital. Click here to read the hospita's statement . 100% of your tax deductible contribution will be sent to Al-Ahli Hospital in Gaza City. You can also make a donation by cheque. The "Disappearing Palestine" ad campaign on Translink, Metro Vancouver's public transit system, which started August 27th, 2013, has triggered a storm of responses, positive and negative. Here are a few examples. Seriously Free Speech Committee, August 27th: "Ad Series Brings “Disappearing Palestine” to Vancouver Public Transit"
Boycott Israeli Apartheid Campaign: "Ad Series Brings “Disappearing Palestine” to Vancouver Public Transit"
Building Bridges Vancouver: "'Disappearing Palestine' Maps Posted!" 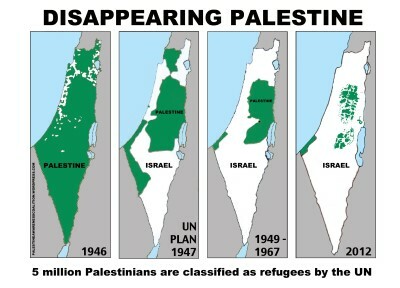 Canada Palestine Support Network (CanPalNet): "'Disappearing Palestine' Translink Ad Campaign"
Independent Jewish Voices action alert: "Are 'Disappearing Palestine' ads anti-Semitic?" Even before the ads became public, Zionist organizations reacted with outrage, attempts to shut the campaign down, and threats of legal action. Translink responded with a summary of their advertising policy. Jewish Federation of Greater Vancouver and Centre for Israel and Jewish Affairs (CIJA), August 23: "Important Community Announcement"
August 25: "Friends of Simon Wiesenthal Center Condemns ads slated for Translink, Vancouver"
Jewish Federation of Greater Vancouver, August 27: "TransLink & Anti-Israel Ads"
B'nai Brith: "Exposé: Who’s Behind Anti-Israel Ads in Vancouver"
Centre for Israel and Jewish Affairs (CIJA): "Factual Analysis of the Vancouver Transit Ads"
Translink media release: "Advertising on Transit System"
Boycott the “Israel at 60” Celebrations! How can you celebrate? The establishment of the State of Israel sixty years ago was a settler colonial project that systematically and violently uprooted more than 750 thousand Palestinian Arabs from their lands and homes. Sixty years ago, Zionist militias and gangs ransacked Palestinian properties and destroyed hundreds of Palestinian villages. How can people of conscience celebrate this catastrophe?